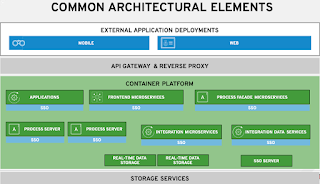 This workshop has a few parts that build up a complete application deployment with multiple services and integration to expose this to any application necessary. 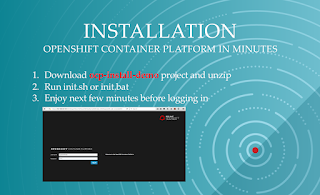 Installing OpenShift Container Platform in minutes. 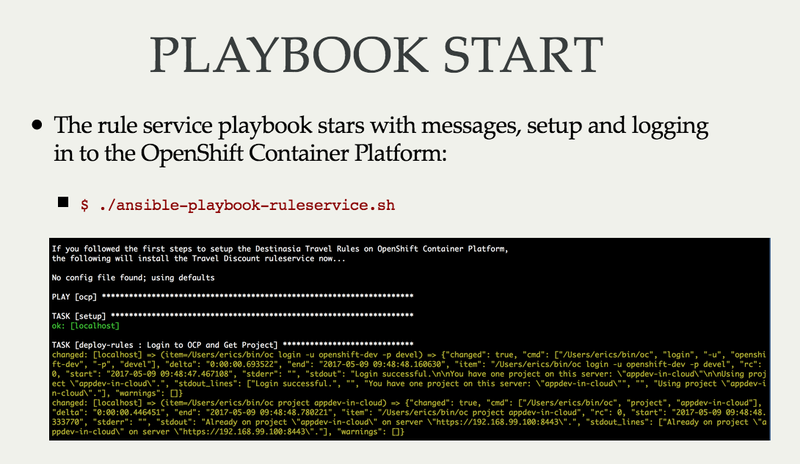 The first part is to get the OpenShift Container Platform installed on your laptop. This should not take more than a few minutes. In the workshop, before you install OpenShift Container Platform, there's a preview video showing how the installation works. 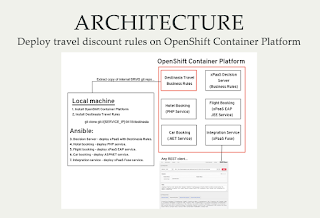 Next up you install a full business rules tool set in JBoss Business Rules Management System with a project container the travel agency discount travel rules in a spreadsheet format. 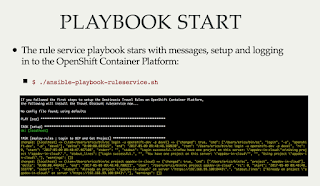 This installation generates a container with the components deployed so that you can log in, verify and test the business logic that delivers discount rules. 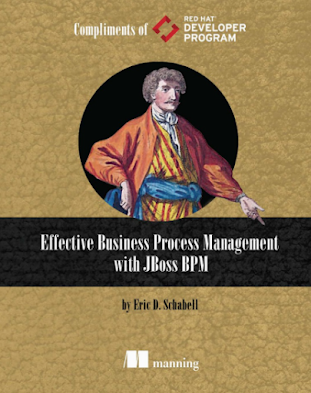 Installing JBoss BRMS and discount travel rules project. Note that the test supplied is broken, so in the workshop you are guided to solve this small 'bug.' 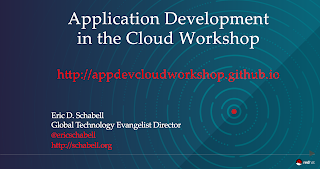 The joys of real application development are integrated in to this workshop! 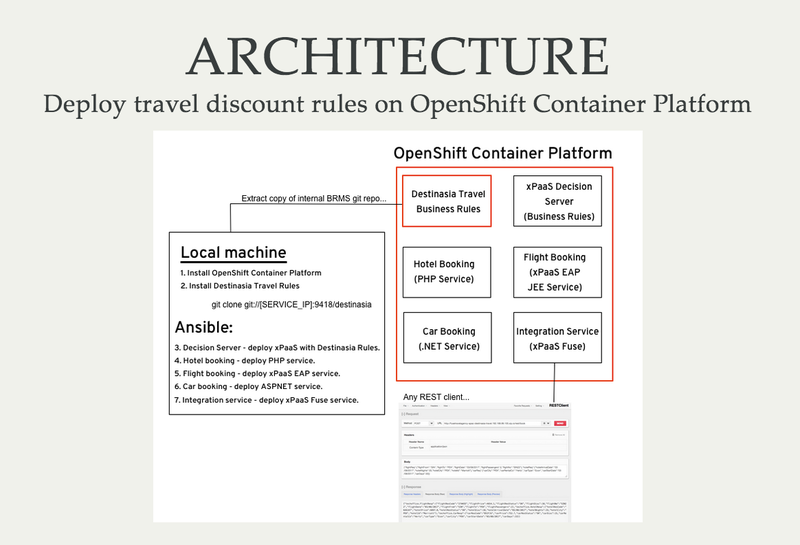 The next portion of this lab has you experiencing the use of Ansible to automate the installation of the various services forming a backend for the travel agency booking process. 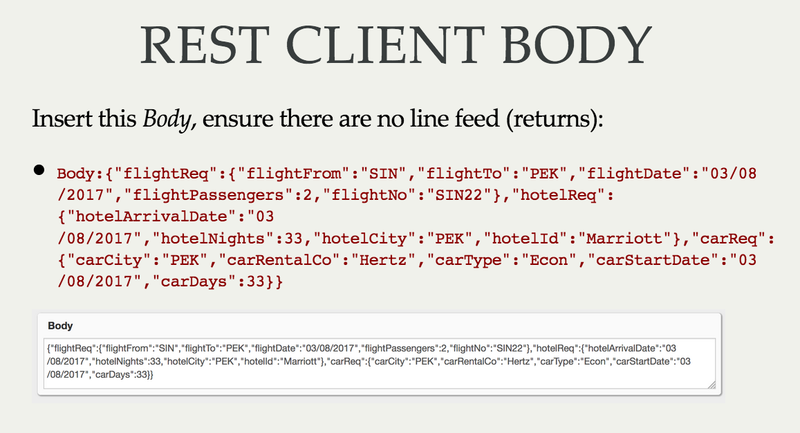 These include an integration service to tie together four services into a single query point and exposes that for any REST client. 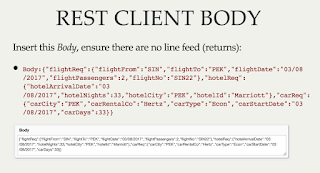 The final portion of this workshop has you leveraging a REST client in your browser to ensure that all services are integrated and working correctly. This simulates any application or service in an organization making use of the travel discount rules and booking features provided by this project. With that you are the proud owner of a completed, six container application running on your own private OpenShift Container Platform Cloud! For those wondering where this workshop came from and who helped make it a reality, I wanted to give some kudos to the large team of contributors. If I miss a name or two, my apologies in advance, but our thanks for the help, the idea or the motivation you gave to pull this together for all the world to enjoy. First off, this project started as a piece of the technology that was originally showcased in a demo for the Latin American Red Hat Forums. 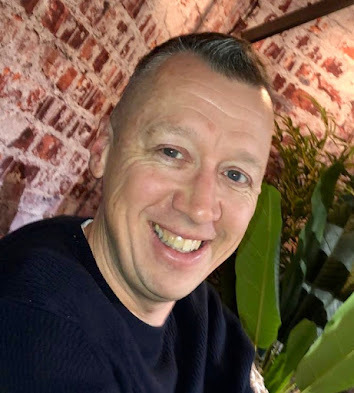 It was a different demo, but the storyline was the baseline from which Red Hat APAC started to put together a live on stage demo for their sales teams. Finish the workshop and become a hero! Following the demo on stage in Singapore, I was tasked, together with Woh Shon Phoon and Christina Lin to create something to expose the regional technical sales teams to the solution. This experience led to this workshop, a repeatable experience for anyone with the interest to learn and basic computer skills. Finally, there have been numerous anonymous workshop attendees from places like the Boston JUG that took the time to raise issues and make parts of this workshop even better. Thanks to you all, we have a fantastic online workshop for everyone to enjoy.